Allied's was a well known company based at Hialeah in Florida who entered the arcade video game business in 1973 by being Atari's first licencee. Their Paddle Battle game was quite successful. The company also manufactured pinball machines, but started suffering from service problems in mid-1976. The pinball machines sales decreased significantly, so much that Allied's decided to enter the home video game market. Moreover, 1976 was the right year to do so as dedicated pong chips developed by General Instruments and MOS Technologies were extremely successful. Not only they avoided designing the game circuitry itself, thus allowing any technician to build his own game with very few parts, but they were also very affordable. Allied's received significant orders from several important customers, totalizing around 60,000 units. However, they did not forecast two obvious problems: the video game chip availability, and the (difficult) FCC approval. 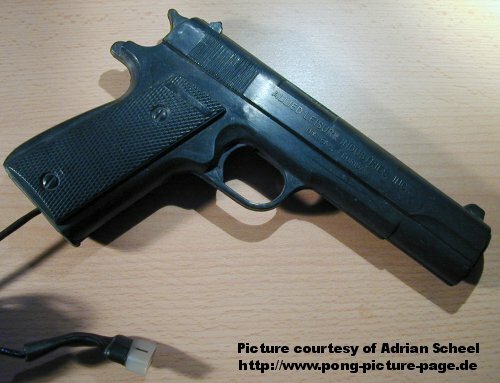 Being approved was the last (but mandatory) authorisation to market video games that met the regulations, and back in 1976, only three agents were allowed to perform the FCC tests in the USA. Consequently, the demand was very high and any fail would simply delay the game availability by several weeks. This proved to be fatal to many small manufacturers whose games never saw the light of the day. Others would simply loose some money by having many orders cancelled, which is what happened to Allied's. Although they did not fail the FCC tests, their approval was obtained in December 1976, two months later than expected. Not a good news knowing that the best moment to sell home video games is Christmas, only two or three weeks after being FCC approved... As a result, Allied's sold for around $350,000 of home consoles only, yet their business plan expected three times this amount, hence a large stock of unsold units. Even worse: the two-month delay finally resulted in over $3 million of cancelled orders. Allied's had planed a self productikon of 25,000 units, of which around 17,000 were built and around 13,000 sold until late 1977. Moreover, the market had completely soften due to the huge competition and price drops. Still, Allied's grossed around $670,000 and only had around 1000 unsold units at the end of the fiscal year. This, however, was a true performance. Other manufacrturers like Executive Games found themselves with much more unsold units. Allied's finally got rid of the remaining units at $15 each. 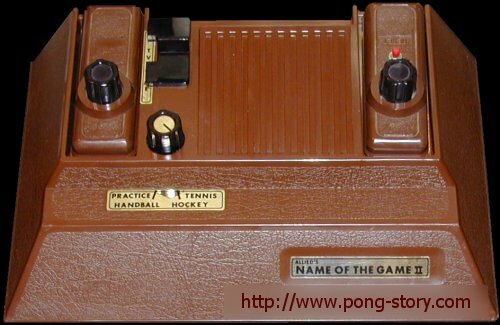 The Company released only two models in 1976: Name Of The Game (model A-100) and Name Of The Game II (model A-300). Both played the same four games, but the former allowed up to four players, while the later was for only two players. Both used Mostek's MCS-7600-001 game chip (this chip was made in white ceramic package, whereas its later version, the MPS-7600-001, was made in a plastic package, hence the thought about the second letter calling for the package type: C for Ceramic and P for Plastic). 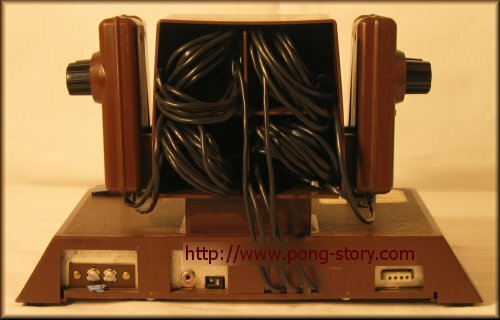 One intelligent feature of these systems was their integrated switch-box, which also served as power switch. Thus, the TV antenna was directly connected to the system, which then connected to the TV through the antenna terminals. 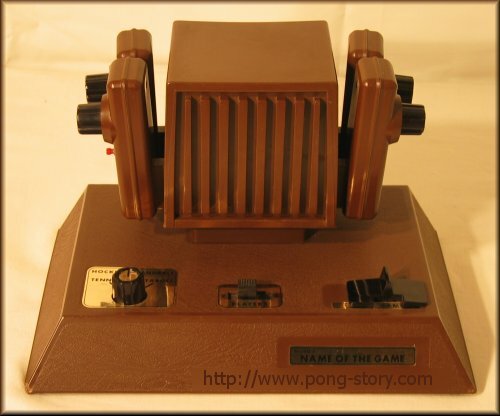 The only backdraw was the need ot keeping the game near the TV, unless an external switch-box was used to allow disconnecting the system. smaller, similar, but only two players. 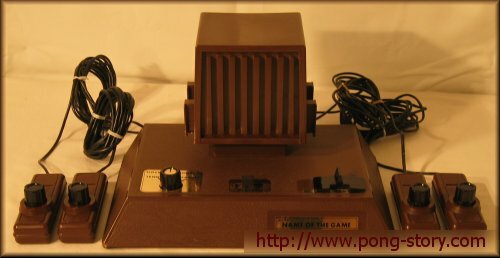 Name Of The Game with its controllers. Cables packed inside the unit !